Dassault Aviation has announced from its Saint-Cloud base in France that it has signed a binding agreement with Luxaviation to acquire the worldwide maintenance activities of its subsidiary, Execujet, this year, subject to obtaining the necessary administrative authorizations. As an international business aviation company, ExecuJet is headquartered at Zurich Airport, Switzerland with 33 facilities operating in six regions worldwide - Africa, Asia Pacific, Caribbean, Europe, Latin America and the Middle East. Established as a maintenance provider the company’s first base was established in 1991 in Johannesburg, South Africa. After substantial worldwide expansion, Execujet was acquired in 2015 by the Luxembourg-based Luxaviation Group. Dassault Aviation has built up expertise recognized worldwide in the design, development, sale and support of all types of aircraft, ranging from the Rafale fighter, to the high-end Falcon family of business jets and military drones. In 2017, Dassault Aviation reported revenues of €4.8 billion (US$5.5 billion). The company has 11,400 employees. Aircraft leasing and trading company Aergo Capital (Aergo) has announced a historic milestone for the company, reaching a portfolio of fifty modern commercial jet and turboprop aircraft, as of December 31, 2018 and valued at US$1.3 billion. This achievement fittingly marks the company’s twentieth year of operation, having been established in 1999 by Fred Browne, Aergo’s Chief Executive Officer. Commenting on the announcement, Browne noted: “Over the last two decades Aergo Capital has grown from a boutique trading entity into a full-service operating lessor with an established servicing platform. Last year was an extremely successful year for the company having closed transactions on eleven aircraft, established our new Hong Kong platform, and completed the securitization of approximately 52% of the Aergo Capital portfolio through our debut ABS structure, METAL 2017-1”. Looking ahead to 2019, the company will continue to actively grow both its platform and global reach and in doing so, announced that Antony Snelleman will join the company as Co-Chief Commercial Officer & Global Head of Risk. Snelleman joins Aergo from his position as Global Head of Sales with Milestone Aviation Group, GECAS’ helicopter leasing business. Prior to Milestone, he served as Senior Vice President and Region Manager Asia for GECAS where he was responsible for a portfolio of some 200-aircraft worth approximately US$8 billion. Angus Clarke has been appointed Executive Vice President Strategy of Air France-KLM. He becomes a member of the Air France-KLM group executive committee and reports directly to Benjamin Smith, Group CEO. His appointment will be effective as of February 1, 2019. He is responsible for defining and implementing Air France-KLM’s long-term strategy, in coordination with all the Group’s stakeholders, as well as business development opportunities in its different entities. The Brand Strategy and Customer Insights department will report to Group General Secretary. Germania Fluggesellschaft has found a solution to cover its short-time liquidity needs. As a result, both the medium- and long-term viability of Germania Fluggesellschaft as an independent medium-sized airline has been secured. The booking situation is good, advance booking figures for the coming months and for the entire 2019 summer schedule are above those of the previous year. Therefore, passengers, suppliers, and contractual partners can continue to rely on the efficiency of Germania Fluggesellschaft in the future. Germania will intensify, optimise, or, if necessary, correct the strategic and structural developments that were started in the past. GE Aviation’s Passport, the first ultra-long-range business jet engine, officially entered service on Dec. 20 during a ceremony by Bombardier Business Aircraft celebrating the delivery of itsfirst Global 7500 luxury aircraft. This milestone was complemented by news on Dec. 18 that GE Aviation secured type certification for Passport by the European Aviation Safety Agency (EASA). Passport was certified in 2016 by The Federal Aviation Administration. Cebu Pacific, the largest low-cost carrier in the Philippines has taken delivery of its first A321neo. The A321neo aircraft for Cebu Pacific features 236 seats in a single-class configuration. The aircraft is powered by Pratt and Whitney PurePower GTF engines. 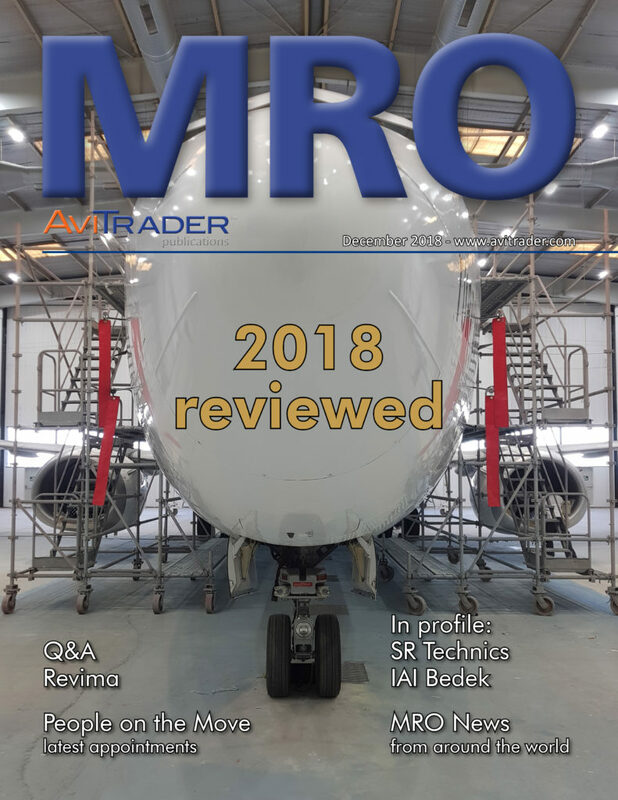 FLYdocs, the aviation data, records and asset management solution provider, has reported exclusive integration capabilities with MRO software solution, AMOS. The powerful combination of the two platforms will allow airlines and MRO service providers to automatically link maintenance and engineering (M&E) work packages with a digital record of their associated data and records, streamlining M&E tasks and providing real-time access to up-to-minute and verified data for airworthiness compliance and quality audits. With a unique FLYdocs-branded interface within AMOS, developed in accordance with ATA Spec standards, FLYdocs® and AMOS users can quickly and easily access FLYdocs®’ functionality. 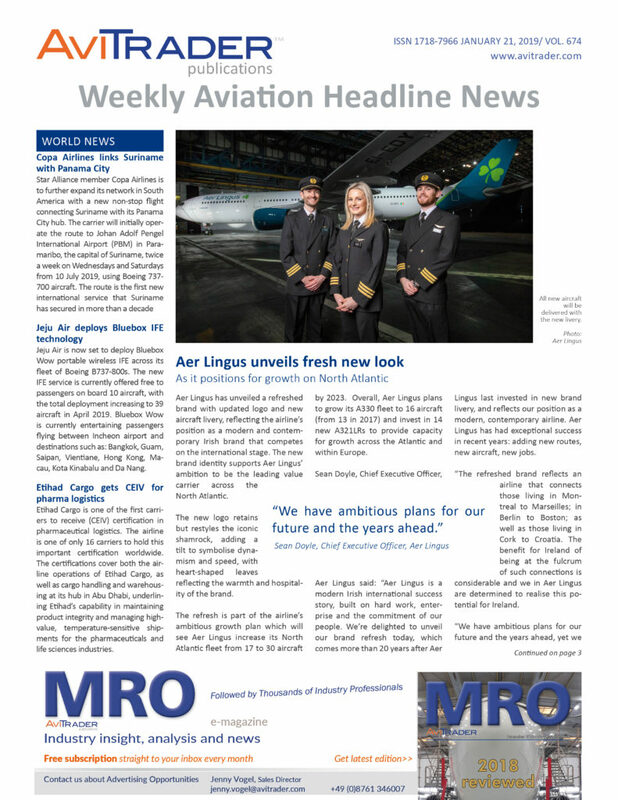 On the tenth anniversary of its founding, WNG Capital, an independently owned, specialist operating lessor dedicated to investing in used commercial aircraft manufactured by Airbus and Boeing, has announced the closing of WNG Aircraft Opportunities Fund II. WNG targeted a US$300 million fund raise to invest in late life narrow body aircraft and is oversubscribed with US$345 committed to-date and a final closing for two additional investors expected in February 2019. Fund II will primarily invest in mid-life to older narrow body aircraft. The new fund will build on WNG Capital’s successful track record, generated since its 2009 inception and realized while building a portfolio of 59 mid-to-end of life aircraft valued in excess of US$850 million. Fund II is expected to acquire approximately 40 to 60 Boeing and Airbus narrow body aircraft with ages ranging from 15 to 20+ years and remaining lease terms of 12 to 48 months. Fund II is closing its first investment and has proposals outstanding for a number of suitable aircraft. WNG has an extensive global network of industry contacts and potential lessees with whom it will partner as it deploys Fund II capital. Aircraft lessor SMBC Aviation Capital has boosted its total order book for the A320neo Family to 181 aircraft after signing a firm order for an additional 65 A320neo Family aircraft (15 A321neo and 50 A320neo). The order was finalised in 2018 and included in the year-end order figures. offers airlines the flexibility to expand their networks using wide-body cabin products on new longer haul routes which were not previously possible with a single aisle. ailing Brazilian airline fell behind with lease payments. Last Friday (Jan.18) Brazil’s aviation regulator ANAC confirmed it would no longer ground ten jets, while another lessor ramped up its efforts to take possession of a further ten aircraft. Both Aircastle Ltd and General Electric Capital Aviation Services (GECAS) have struggled to take back possession of these aircraft after Avianca filed for bankruptcy protection back in December 2018. Last Thursday ANAC confirmed it would ground ten aircraft at the request of GECAS, but a day later advised it was no longer prepared to intervene in the dispute. Separate to GECAS’ dispute, a representative for U.S.-listed Aircastle confirmed last Friday the firm would be filing an appeal of a legal order that stayed repossession of Avianca Brasil’s planes for 15 days until Feb. 1. Aircastle has 10 planes on lease to Avianca Brasil which is its biggest customer. According to Reuters, Avianca Brasil said in a statement that it “continues operating normally,” but did not directly address a question on how an appeal from Aircastle could affect its operations. Cape Town Convention.” This was in reference to a little-known international treaty that allows for swift repossession of aircraft which both Brazil and the United States have signed.